Elaras gig is up. Sturges the not so dead bowls down into town, where Ravyn and the young Elara are mulling around, thinking of something to do with the excess Manticore sitting about, Ravyn grins and Elara pouts. Enter the Cygnarian cut throat of a Warcaster, seeing a good fight, the gambler in him did wholly muster. Hood concealing steely eyes, Sturges wagers a bet on lives. To which the elven women are easy to accept. But at the price of failure the cost of confidence is paid with debt, as the deft and still skillful Sturges collects the bounty on Elara's head. Phoenix proxy for the third Manticore. So by the second turn he sniped the Stormwall, didnt know about this. It sauntered up and shoot Elara right in the face. I was worried about the threat of the Gun Mages if I was really being careful I would have had Elara with the Artificer sitting behind the wall. But I didnt. The HRT's were a bad choice over all but I wanted to try them, the draw back was I tried to protect them and tried to use the scenario to take advantage of them. If they were not there then Elara would have definitely had more cover, that and not thinking about his threat lost her early. Gun Mages rolled up high, hitting Eyriss (who missed them) on the first roll of 9 and killing her outright. The others dropped a gunner each from the rifle teams. Not the best start for me, great for him. Ravyn feats and fails. One point for objective one point from Arcanist on flag. Analyzing the weight of fire I could put down and not being aware that the Stormnouns did have arc shield on them Ravyns feat turn was lack luster. Aiyanna kissed the objective and Holt put 9 damage on it, but it took 3 more Invictors to finish it off. The other Invictors worked on the Stormnouns and did poorly due to an un marked Arcane Shield which I thought was on the Stormwall. First Manticore fires 3 times and nets 0 kills, the other nets 2 out of 3 shots. 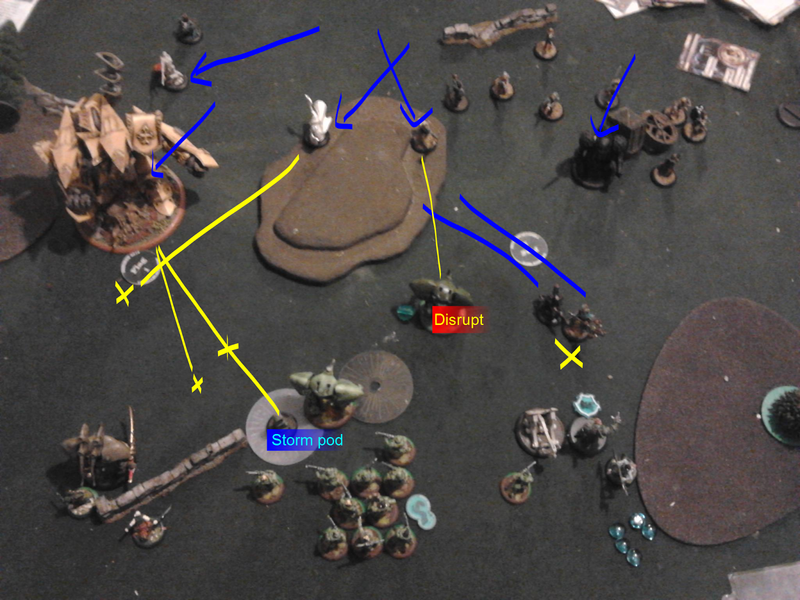 One Invictor didn't fire and advanced to the inert Manticore along with the Arcanist as we were not sure if once it was re activated the Jack Marshals could Marhsal it or if they had to activate it themselves. Ravyn herself and the HRT in front of her fail to produce any kills, and the HRT to her left kills one and swift hunters to fill the gap. A foolish move for if the Marshaled Cygnarian jack had hit they would have all been knocked down. In that respect I got lucky. 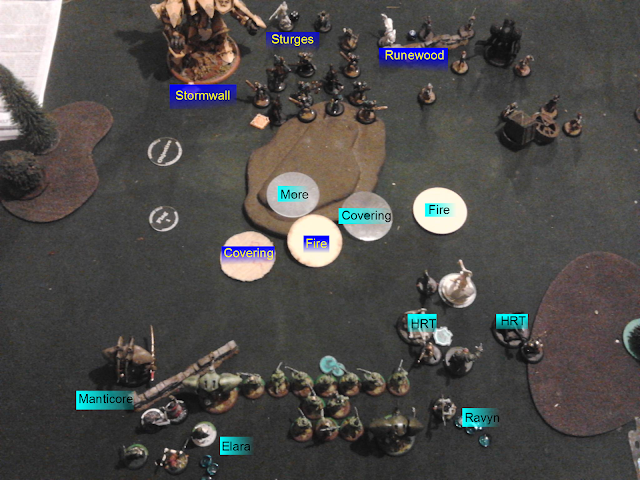 Runewood comes up and shoots off the Arcanist. The 2 Stormnouns take out the objective while his Jack misses its shot. 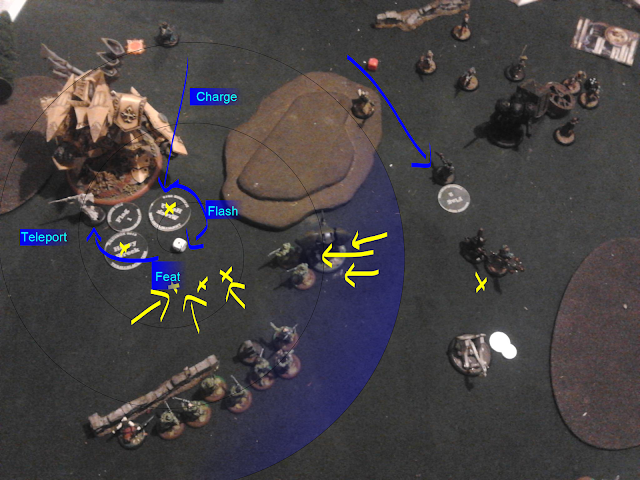 The Gun Mages push back my Manticore with a few shots while the Storm Caller disrupts it. 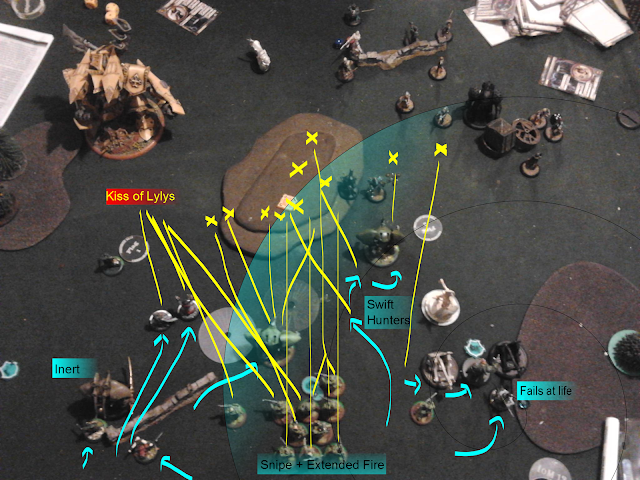 On the other side the Storm Pod goes down and zaps out Holt, then the Stormwall shoots Aiyana in the face. Its about to all go bad. Seeing that extracting revenge for Elara is quite likely out of the question Ravyn retreats from the Gun Mages, if I was feeling more ballsy she may have just run in and engaged them, but that jack was giving me the heeby geebys. Ravyn drops back and puts snipe on the HRT which rolls and does 0 damage. The disrupted Manticore shoots and nets 0 damage. 2 Invictors only are in range of Stormwall and combine for... 4 damage. 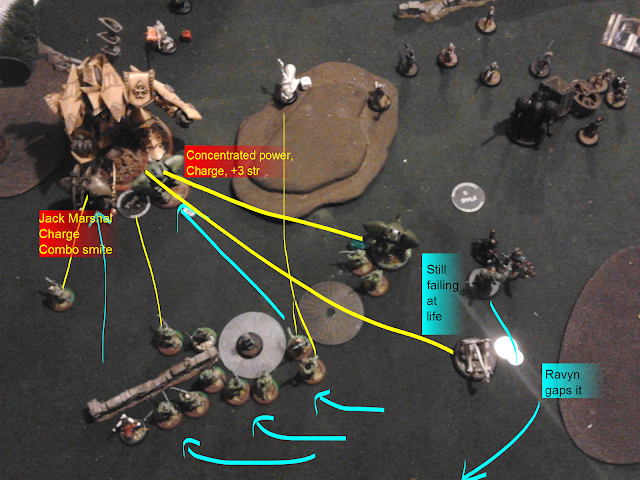 The Marshaled Manticore Charges and puts on 14 damage. The other Manticore gets Concentrated power and Charges with D+1 and nets a total of 19 damage over 3 attacks. Two of the other invictors shot at Runewood with dice for damage and leave him on one box. Sturges Feats masterfully and nets 3 points to win. So Sturges charges the Manticore he can see. He chain attack flashes to the far side of it and feats, it pulls the far Manticore away from contesting. 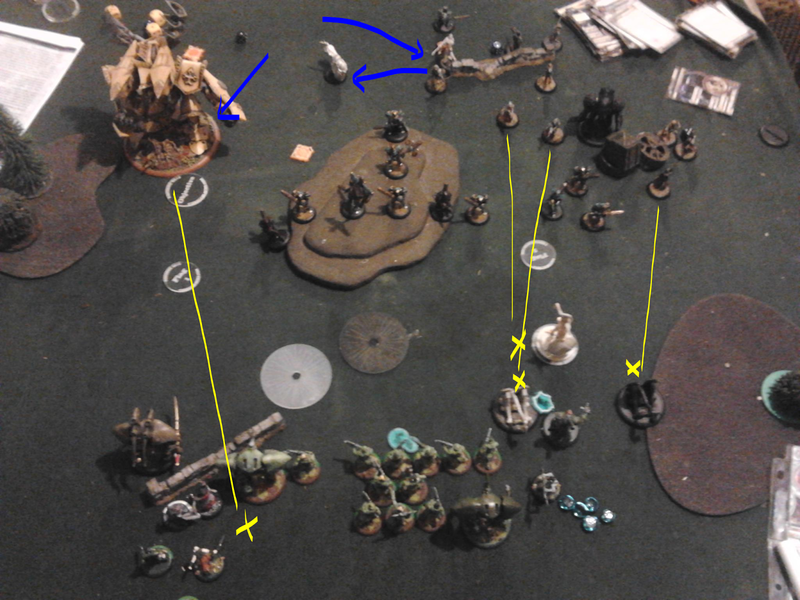 It pulls in the Arcanist and 2 Invictors and this lets him net the kills and feed the focus to the Stormwall. He then goes on to wreck one Manticore and mess up the other with some amazing dice rolls before teleporting to the objective. The Stormwall has no issue killing a half dead Manticore with 3 focus and the Stormnouns take out the Artificer easily. Defeat! Cygnar: 5, Retribution: 2. Thats game, I didnt quite expect it to go like that. One turn of below average rolling followed up by Sturges super awesome damage and movement took me by surprise. The HRT's really didnt perform and I was left at the end of the game wondering if I really should have taken either Strike Force or if 3 Manticores was just a bad gimmick. My opponent professed that the covering fires were a pain and they put hurt on his Colossal but I was still skeptical. I felt like I needed more punch. However the fact of the matter is in most cases if they have a Colossal/Gargantuan I will likely run Ossyan or Kaelyssa, OR Ravyn with Strike Force for the assassination potential.